Creative Biz Archives - What's Your Mud? A New Reason to Hop, Skip and Jump! Have I ever told you I’m a sucker for books? Well I am! Especially ones that are more for the right-brain population (yeah, that’s me). So when I received an email from Liz who is the Hop Skip Jump Blog Play Date Coordinator for Marney Makridakis, to see if I’d be interested in reviewing Marney’s newest book and share the review on my blog, of course I said, heck yes! So I am reviewing this book as part of the Hop, Skip, Jump Blog Celebration. I received a copy of the book from the publisher and am listed on Artella Land’s roster of 75 featured blogs. My opinions are my own honest reflections about this book. I loved Marney’s first book, Creating Time, so I had a feeling I was going to love this one too. In her newest book, Hop, Skip, Jump 75 Ways to Playfully Manifest a Meaningful Life, Marney shares a ton of really unique tools and techniques that allow you to have more fun while you amp up your productivity, creatively (hence, while having more fun!). One thing I loved about the book is the concept of hopping, skipping and jumping to a more meaningful life – that just sounds like so much more fun and seems that it would have much more flow to it then struggling to figure it all out. 1. 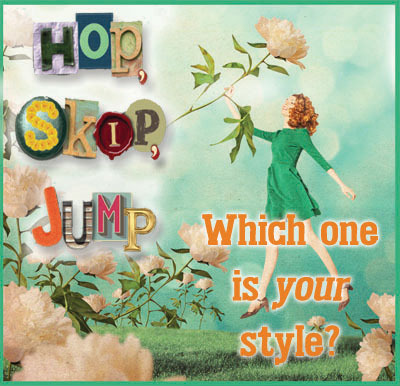 Hopping refers to having an idea or impulse and exploring it in your imagination. 2. Skipping refers to experimenting and trying new things. 3. Jumping refers to quickly moving into action. You can take a quiz to see what phase you tend to associate more with and see whether you are more of a Hopper, Skipper or Jumper. Just hit the image below to be taken to that quiz. One of my favorite techniques in the Hop phase is summoning your superhero. This brought me back to my Wonder Woman days, (and the Bionic Woman too of course) and it was a lot of fun to think about what powers my superhero would possess and how I could incorporate them into my own life. And then to think about how that would change how I approach certain ideas, challenges and insights. And another technique I loved was in the Skip phase called Playful Procrastination. I’ve had my share of moments and moments of procrastination. But this technique helped me do a total 360 shift in perspective around procrastination. I now see it as an opportunity and that is SO refreshing! There are so many other tools and techniques that I loved in this book. I highly recommend checking this book out if you’re into discovering fun, creative and unique ways to move toward your most meaningful life. Hope you enjoy it as much as I did and will be as I refer to this book again and again. Happy hopping, skipping and jumping!